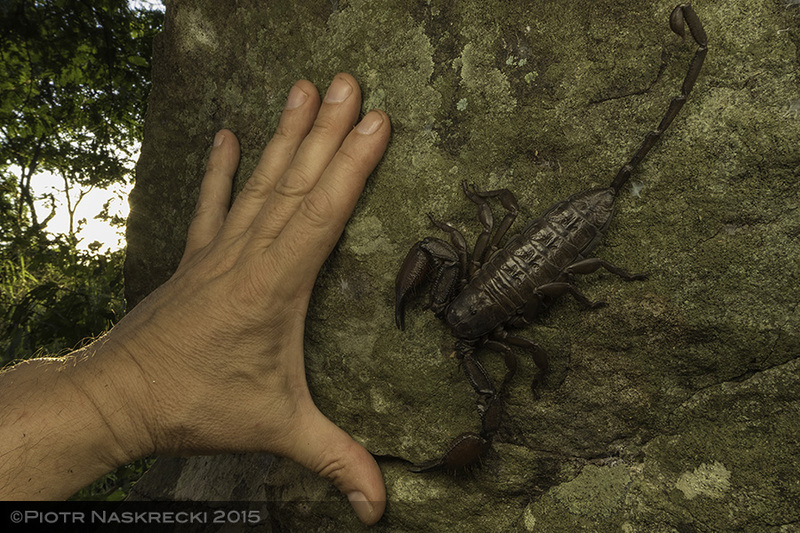 Rock scorpion (Hadogenes granulatus) from Bunga Inselberg in Gorongosa, one of the largest scorpions in the world. One of the more entertaining consequences of posting images of obscure, rarely seen animals on this blog or on my Facebook page is that I am sometimes accused of faking them, especially if a Google search by those who doubted the veracity of my photos did not produce similar pictures taken by other photographers. This happens particularly often with animals that are the largest of their kind, be it a giant land crab or, more recently, a parasitic bat fly. I wonder if the photos in this post will be met with similar incredulity. 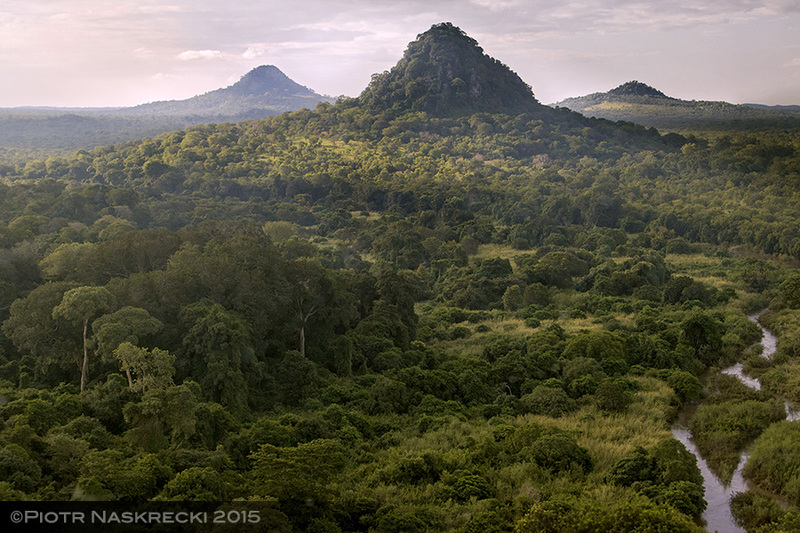 Last month I lead (lured) a group of researchers to a remote corner of Gorongosa National Park to continue the documentation of the biological richness of this remarkable place. Our camp was at the foothills of the Bunga inselberg, one of several small, isolated mountains in the western part of the park. These inselbergs have never been biologically explored and although we did not expect to find any endemic species there was always a chance of encountering rare or new to science organisms. These inselbergs are, in an essence, giant piles of volcanic rock, covered with a very thin layer of topsoil and a dense carpet of woody vegetation. Such a habitat is heaven for a lot of animals but, to my great relief, not lions and elephants. This meant that we could roam freely around the inselbergs in a relative safety, not constrained by the need to be always accompanied by armed park rangers. I say “relative” because Africa is rich in things that can get you, and Bunga inselbergs were no different – on my first visit there my friends and I were attacked by a cloud of wild honey bees, and on the following day I pulled nearly 150 stingers from my arms and neck. 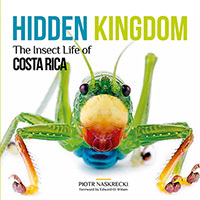 (It was a close call – I remember thinking “At least this is the end fit for an entomologist,” before losing consciousness.) Thankfully there were no similar incidents during this survey, although I did make sure that every person carried an Epipen kit to treat potential anaphylactic shock. The median ocelli of the rock scorpion (Hadogenes granulatus) are protected from scratching against rocks by elevated ridges (green arrow). These are absent in species that live in equally constrained but softer environments, such as this Opistacanthus (below) found under tree bark. Lifting heavy volcanic rocks to look for animals during the survey was hard work, but it was also immensely rewarding. Each flat piece of basalt could have been hiding a cool gecko, a snake, a family of crickets, some awesome beetles, or a scorpion, and it was the last one that gave me the biggest surprise. 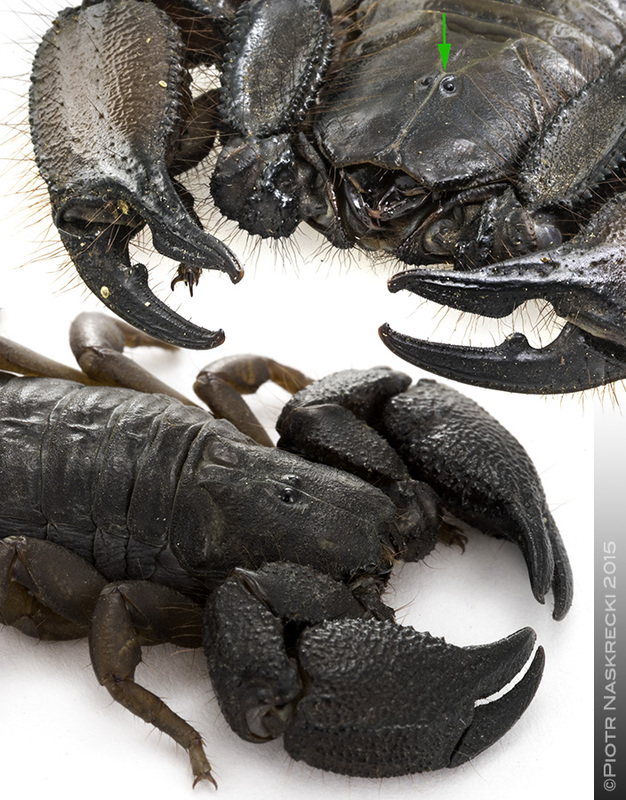 Rock scorpions of the genus Hadogenes are considered the largest, or at least the longest, scorpions in the world. Some species can reach the length of 22 cm and several individuals from Bunga were at least this big. Granted, a large portion of the body is the long and thin telson (“tail”) of the animal, but it is still a spectacular beast, which will make you pause when you see it scurrying around your fingers. All species of Hadogenes are obligate lithophiles; in other words, they love rocks. Their bodies are perfectly adapted to squeezing into narrow crevices, and their feet carry stiff setae and strongly curved claws that allow them to cling to even the smoothest rocks (and hang from rocks upside down, something that few other scorpions can do). Their median ocelli – the main pair of eyes – are protected by elevated ridges that prevent them from scratching against the rocks, and the entire body is flatter than in any other scorpion of similar size. 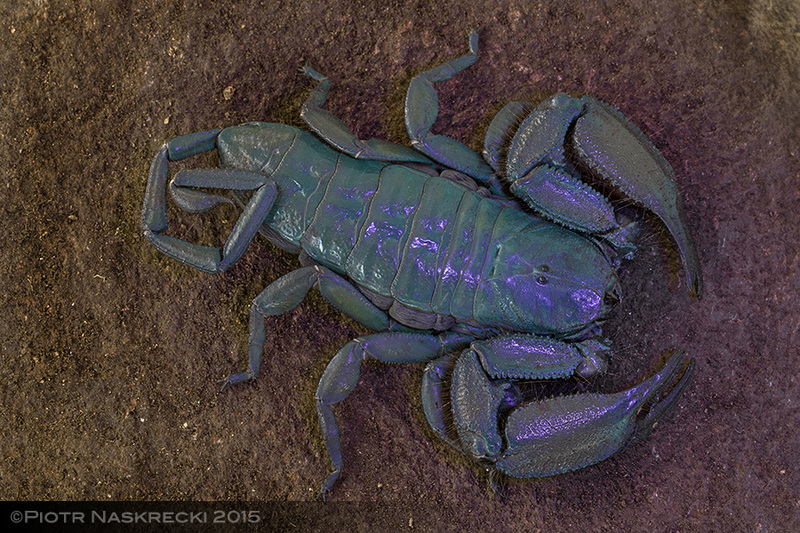 Like many scorpions, members of the genus Hadogenes display a beautiful, blue fluorescence if exposed to ultraviolet light. A recent study suggests that this helps these nocturnal animals detect and avoid light. But, as it is often the case, a large size and a scary appearance do not necessarily translate into true ability to inflict harm. The giveaway is the telson, which in rock scorpions is long and thin, betraying the presence of weak muscles and a small venom gland, and thus the lack of reliance on venom for capturing prey and defense. They can and do sting, of course, but the strength of their venom is no greater than that of a bee (and, thankfully, scorpions do not move in large swarms and are far more friendly than those pissy little bits of flying pain). A few species of Hadogenes have the ability to spray venom towards the attacker, which can cause painful irritation if the droplets get into your eyes, but otherwise they are harmless. In fact, an article (pdf) describing the medical importance of rock scorpions puts more emphasis on their ability to pinch your fingers then to envenomate. Scorpions of the genus Hadogenes occur in rocky habitats across southern and East Africa, often on isolated mountains, leading to frequent allopatric speciation and a high number of endemic species. When I first found rock scorpions on Bunga I was hoping for a new, undescribed species but, alas, this turned out not to be the case as they were all members of H. granulatus, a species known from other places in Mozambique. 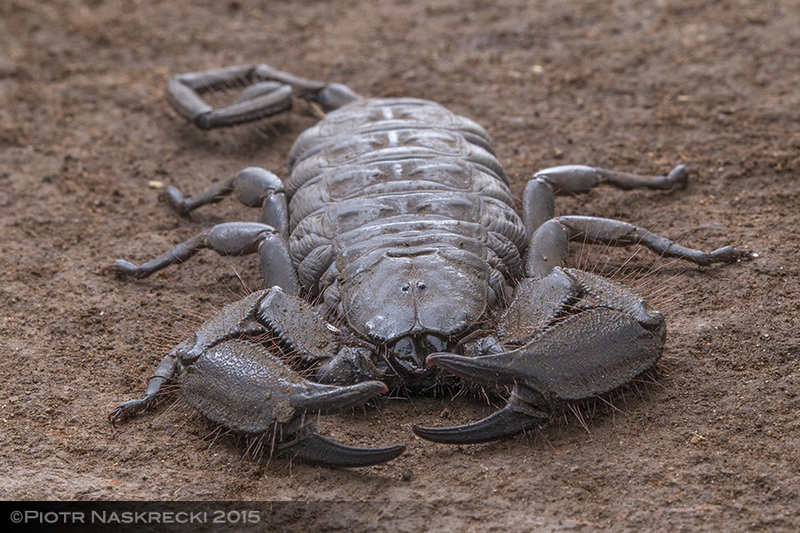 Rock scorpions’s body is strongly flattened, perfectly adapted to squeezing into the narrowest of crevices. 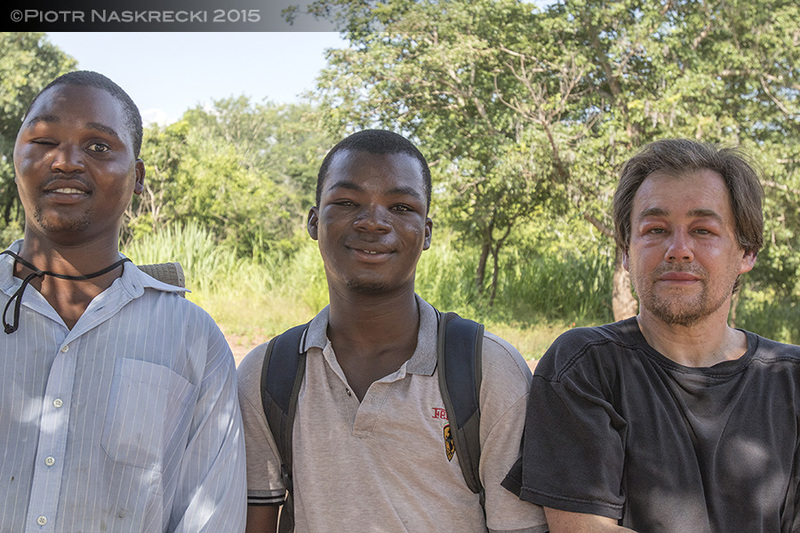 Flavio Artur, Ricardo Guta, and I, 24 hours after being attacked by a swarm of wild African honey bees. On that morning I pulled out nearly 150 stingers from my skin. I encountered a variety of ant that inhabited Acacia trees in central Tanganyika. It seemed to me they somehow irritated the ends of branches that caused the tree to form a gall (about one inch diameter) that the ants lived in. They filled the gall with fiber-like thread. I think it was a form of excreted film that later hardened. A microcosm of ant life. I am very relieved for you that you survived the stings. As a beekeeper I know how much just one sting can hurt – you must have been in a great deal of pain. You all actually look better than I would have expected in that photo. Fascinating post and beautiful photos! 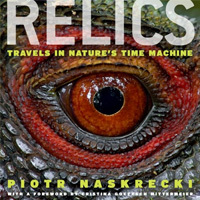 Enjoyed your wonderful story and beautiful photos of the scorpions! They certainly show the adaptations for life in the crevices. I felt really bad for you guys getting stung so many times by the bees! So many people never see this side of field biology! Glad you posted the photo of you three suffering from those terrible stings! 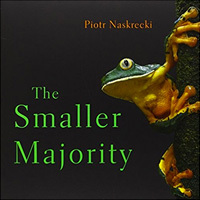 Keep up your fantastic research and taking the magical photos of the smaller majority! I guess people are so used to being lied to online that they are just naturally skeptical when they see something new or unusual. Those of us who know your credibility just stand by in awe of what you photograph. Good to see that you are still alive Piotr! Amazing stuff as usual! Thank you for posting! 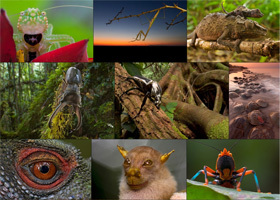 What amazing creatures…. You lead a very adventurous life !!!! and so young still ! That scorpion is amazing, I first thought is was an iron decoration ! It sounds fantastic! I really want to go there, despite the bees! Excellent post (no surprise here!) but what I like most about it is that it reveals the painful truth about working in the wild. Field biologists are too often being accused of enjoying a “paid vacation” when they travel for fieldwork, completely ignoring the fact that this type of work involves a great deal of personal risk. We all have numerous stories of how we got bitten-stung-sick-broken bones etc’ while doing fieldwork, nevertheless the public almost never hears about it. It does not retract from the joy of doing science though, just look at the facial expression of Piotr and his colleagues! Fascinating, Piotr. 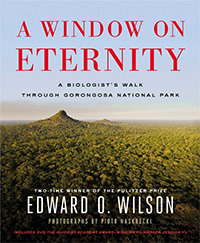 I love your posts of natural life in Gorongosa.